The seventh Ariane 5 flight of the year took off at 2030 GMT (3:30 p.m. EST; 5:30 p.m. French Guiana time) with the Star One D1 and JCSAT 15 communications satellites. 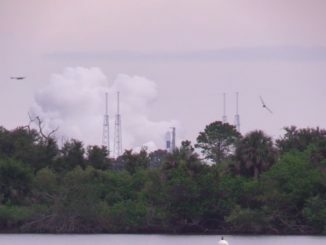 The 180-foot-tall (55-meter) rocket lit its Vulcain 2 main engine and two solid rocket boosters after a smooth countdown, launching through partly cloudy late afternoon skies over the equatorial spaceport located in Kourou, French Guiana. The rocket dropped its two strap-on motors in the Atlantic Ocean, then shed its hydrogen-fueled core stage to fall into the Gulf of Guinea off the western coast of Africa. An upper stage HM7B engine finished the job of injecting the mission’s two payloads, both manufactured by Space Systems/Loral in Palo Alto, California, into an arcing high-altitude geostationary transfer orbit with a high point of 22,319 miles (35,920 kilometers), a low point of 154.8 miles (249.2 kilometers) and an inclination of 6 degrees. The orbit was right on the money in inclination, within 300 feet (100 meters) of the intended perigee, or low point, and around 9 miles (15 kilometers) higher than the targeted apogee, or high point. The 14,182-pound (6,433-kilogram) Star One D1 satellite deployed from the upper position on the Ariane 5’s dual-payload stack, followed by separation of the smaller 7,500-pound (3,400-kilogram) JCSAT 15 spacecraft around 43 minutes after liftoff. Engineers and managers inside the Ariane 5 control center donned Santa hats in celebration of the launch, which extended the Ariane 5’s streak to 76 successful flights in a row. Star One D1 will support video and radio broadcasters, Internet service providers and direct-to-home television programming, satellite telephone calls, and high-speed data transmissions over Brazil, Mexico and other parts of Latin America. Owned by Embratel Star One of Brazil, Star One D1 will extend coverage currently supplied by the aging Brasilsat B4 satellite, which launched on an Ariane 44LP rocket in August 2000. 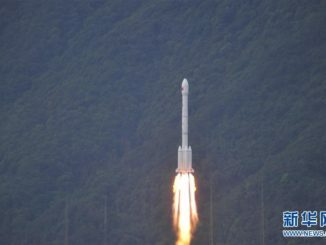 The JCSAT 15 satellite, operated by Tokyo-based SKY Perfect JSAT Corp., will cover Japan and neighboring countries in the Asia-Pacific and Indian Ocean regions, replacing the N-SAT-110 communications craft also launched by Arianespace in 2000 aboard an Ariane 42L rocket. JCSAT 15 will broadcast pay television channels for SKY Perfect JSAT’s SKY PerfecTV! service, which counts 3.4 million subscribers in Japan, and enable data transfer and maritime and aviation connectivity. David Bernstein, senior vice president of program management for satellite builder SSL, said ground controllers at the company’s Palo Alto facility established contact with both of the newly-launched spacecraft soon after separation. 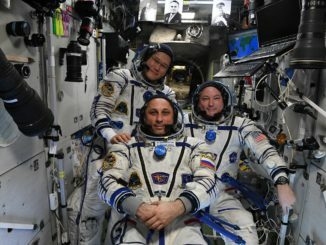 The satellites will use on-board thrusters to circularize their orbits nearly 22,300 miles over the equator, where their velocities will match the rate of Earth’s rotation. The geostationary orbit means the craft will remain fixed over the same location, providing constant coverage and allowing users on the ground to keep their antennas pointed to the same place in the sky. Star One D1 is heading for a location along the equator at 84 degrees west longitude for its 15-year mission. 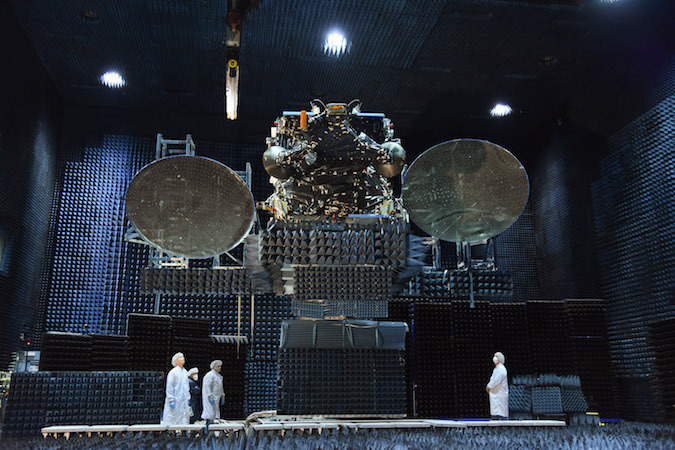 “Star One D1 is the ninth member of the company’s fleet, and the largest satellite ever built for Embratel Star One,” said Gustavo Silbert, the company’s president. “It’s part of our fourth generation, named Family D. It will provide unprecendented satellite capacity in Brazil, Mexico and South, North and Central America. Silbert said Star One D1 will be used by television stations, independent television channels, banks and Brazilian government agencies, supporting applications in entertainment, telemedicine, teleeducation and business. JCSAT 15, which will be renamed JCSAT 110A, is also designed to function for at least 15 years in space. 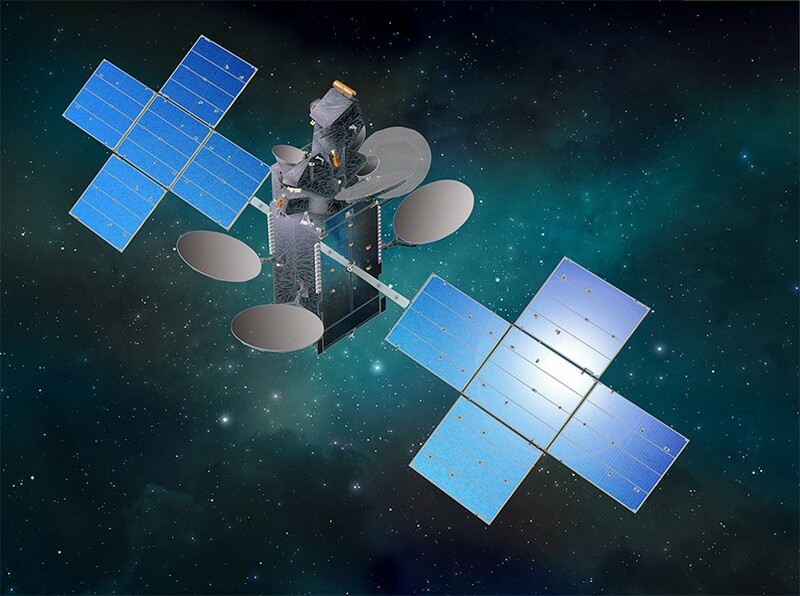 The craft is the third satellite to join SKY Perfect JSAT’s fleet this year, following two successful launches on SpaceX Falcon 9 rockets from Cape Canaveral. 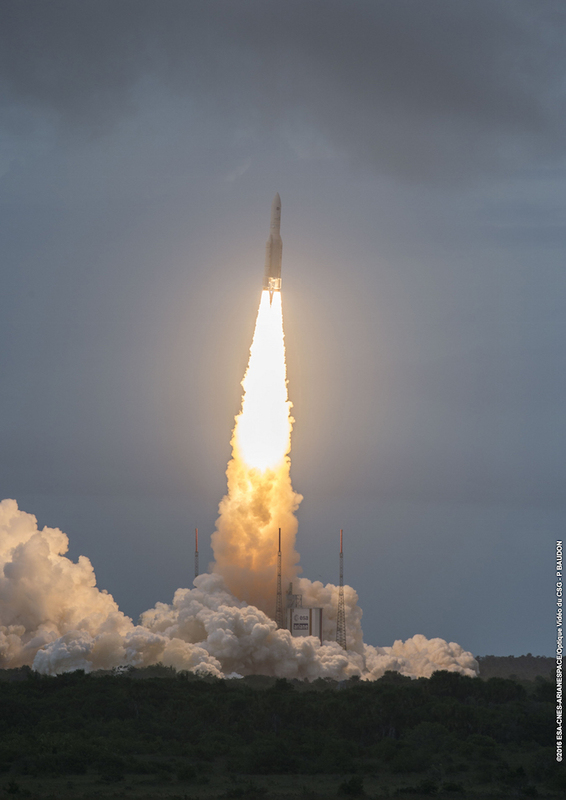 Wednesday’s commercial mission was Arianespace’s 11th launch overall this year — a tally that accounts for Ariane 5, Soyuz and Vega flights — lofting 27 satellites, including payloads for large telecom operators, Europe’s Galileo navigation system, Earth observatories for commercial and international customers, three student-built CubeSats, and a French research satellite to investigate a principle of Albert Einstein’s theory of general relativity. The payloads’ mass totaled more than 135,300 pounds (61.4 metric tons), according to Arianespace. Arianespace’s next launch is scheduled for Jan. 27, when a Russian-made Soyuz booster will blast off from the Guiana Space Center with the Hispasat 36W-1 communications craft, debuting a new satellite bus design jointly developed by the European Space Agency and OHB of Germany. The next Ariane 5 launch is expected in mid-February with the Intelsat 32e/Sky Brasil 1 and Telkom 3S communications satellites.